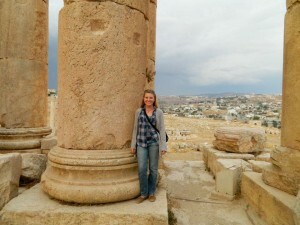 Lauren at the Roman site of Jerash in northern Jordan, 2011. As TARL’s new Curatorial Assistant, I’m excited to get to work rehabbing some of TARL’s great old collections and helping make all that material and information accessible to other researchers. My background is mostly in Mesoamerican Archaeology, but I’m a Texas girl at heart and a Texas State alum (go Bobcats!). I have a deep love for Central America, Mexico, and the desert Southwest, which inspires me to help preserve the cultural patrimony of these areas and to help ensure that their stories are a part of our shared world history. As one of the largest repositories of cultural material from sites across Texas and beyond, TARL plays an important role in conserving invaluable material and information, facilitating dialogue, and promoting innovative research—and I am honored to be part of this great team! As a graduate student in Anthropological Archaeology at the University of California, San Diego, I conducted field research in Belize, Mexico, and Jordan, as well as some CRM work in California. My Master’s work focused on warfare and defensive structures in the northern Maya Lowlands, building off my excavation of the site perimeter wall at the Late and Terminal Classic site of Chichén Itzá. My post-M.A. research included looking at intra-site exchange patterns across households at a minor Maya site in Belize, as well as research into chemical analysis methodologies for stone tools at Bronze Age sites in Jordan. Working on such a range of projects, I gained a strong appreciation for the importance—as well as the difficulty—of ensuring that archaeological data is precise, detailed, organized, compliant, and most importantly, easy to interpret by future researchers. Part of my challenge here at TARL is to consolidate records from old projects, bring them up to contemporary standards, and organize them to facilitate future analysis. Meanwhile, I’m also working to update artifact inventories and ensure that these irreplaceable artifacts are stored in such a way that they will be preserved for many years to come. This is no easy task, given that some of TARL’s collections date from the days when archaeology was in its infancy! In my spare time, I enjoy running, yoga, hiking, spending time with my husband and two cats, and gardening. I am also a hobby beekeeper, so please call me if you see a swarm that needs a good home!